A starting rate of $7.50 per page certainly sounds inviting, but is it true that essayoneday.com has 9.5 out of 10 average quality score? Even though this is the number presented on the website, the testimonials we looked online for the purpose of this Essayoneday review were mainly negative. Unfortunately, the website of this company is not very good, since it lacks some important pages and information, such as services and prices. Regardless, we found the full list of services offered in the ordering form. If you take a look at this list, you will learn that Essayoneday.com is not one of the companies that offer it all. Yes, they do offer assistance to students of all academic levels, but this list only contains the most commonly assigned papers. The only indication of pricing on the website is the starting rate of $7.50 per page, and the first-time discount of only 5%. However, you cannot know the actual rate for an academic paper unless you fill in the ordering form. 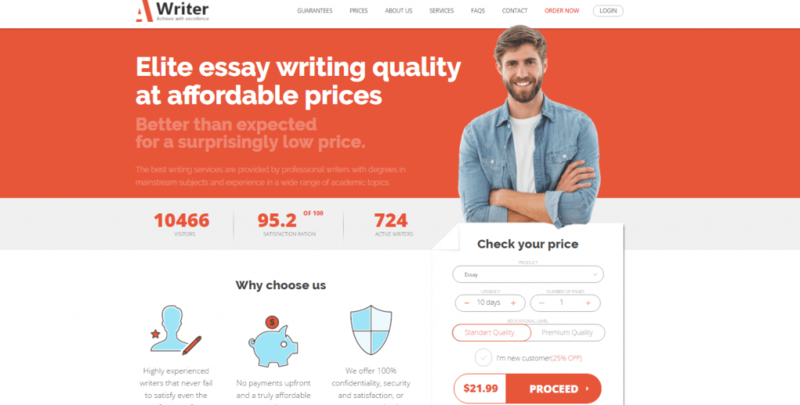 When we did this, we learned that essayoneday.com is a cheap writing service, which makes it understandable why they cannot offer a higher newcomers’ discount than 5%. Still, the lack of a loyalty program or bulk discounts of any kind is a bit of a disadvantage, even though the company is incredibly cheap to start with. We found out that essayoneday.com is a cheap writing service, but one with a limited range of services offered. Regardless, every student would appreciate getting high quality content for such a low rate, even if they can only order the most popular papers from this provider. The bad news here is that the quality is not great. We ordered a term paper from the service, and got an excellent rate for the service. The writer who did our paper met the deadline and delivered half a day before it was finished, but the paper needed much more than simple proofreading. As a matter of fact, we believe that the quality of content did not even fit the academic level we ordered it for, and the writer was not experienced in crafting this type of paper. When we got the low quality content, we decided to get in touch with the customer service and see if they can help us. EssayOneDay really has a 24/7 customer service, and the agents reply to customers’ queries almost instantly. However, the agent only accepted one request for a revision that turned out to be a waste of time. The second time we asked for a revision because of the poor content quality, the agent politely rejected our request. Even though the customer service seems to be doing well and the agents here are professional, failing to provide the guarantees mentioned on the website is a sign of a scam service. Essayoneday.com is a cheap writing service, and as is the case with most cheap services, this provider also works with low quality writers. Their customer support is good, but guarantees are non-existent.